I’ve be en spending a lot of time on Office 365 recently, so it was nice to have the opportunity to work on an Exchange on-premises book for a change. 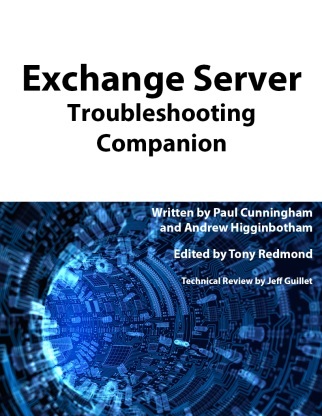 I’m delighted to say that MVPs Paul Cunningham and Andrew Higginbotham have completed their “Exchange Server Troubleshooting Companion” eBook that is now available to purchase on ExchangeServerPro.com. 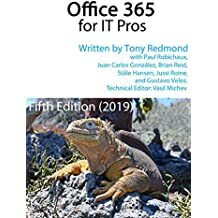 I was the overall editor of the book, a role that I have got a lot of experience in recently, mostly working on the “Office 365 for Exchange Professionals” eBook. The writing team is currently working to complete the third edition and we expect it to be available at the start of June. I think that this book is a useful tool for any on-premises administrator who wants to learn from some of the best pros in the business. The 12 chapters and 300-odd pages are laid out in a practical and accessible manner. There’s lots of value to be found, not least in the set of curated links to additional resources that is included for each chapter. The web is great, but there are many poor sites out there that contain bad, misleading, or poorly written content, so having a set of recommended reading for topics like Performance or Clients is invaluable. Hopefully, you’ll like the book and will find it both interesting and useful. I think you will, but I’m biased! This entry was posted in Exchange, Exchange 2010, Exchange 2013 and tagged Exchange 2013, Exchange 2013 book, Exchange 2016. Bookmark the permalink.